People keep demanding your time without considering how it impacts you and your team. Your to-do list grows every day, but you never seem to get to the bottom of it. Sound familiar? With the Managing Upwards eBook, you can start working better and smarter. 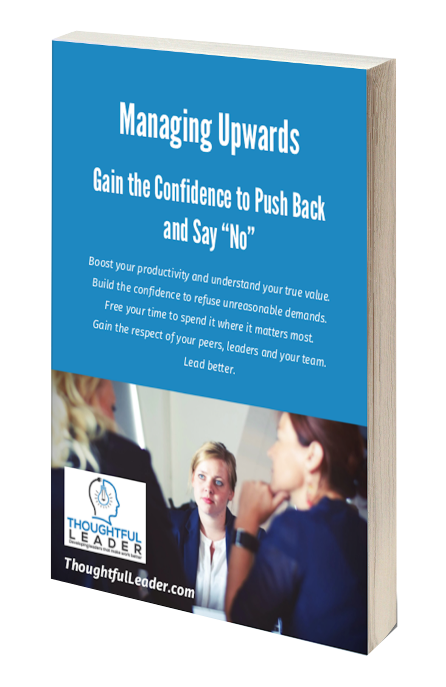 Including practical worksheets to help you learn, this simple eBook will help you gain the confidence you need to safeguard your time and be a better leader. You Can Manage Your Time Better and Stop Being Overwhelmed. Now you can reduce your stress levels and improve your mental health. Start pushing back on unreasonable demands and start putting yourself and your team first. Reduce your workload, and have more time to spend on what matters to you. The information in the this eBook is suited to all types of leaders. Whether you lead projects or other teams, it doesn’t matter. You need to start managing upwards effectively. This eBook contains useful, practical information in an easy to use format. It also contains simple exercises to help you manage upwards effectively.